I had a mixed feeling of excitement and apprehension when I left Punta Arenas for the flight to Puerto Natales. I was excited because the day that I had been waiting for finally arrived - the highlight of my trip in South America, a visit to Torres Del Paine - among the top of my list of places to see before I die. At the same time, I was afraid that the travel operator would cancel the trip that broke my bank due to the bad weather. Our travel coordinator called out my name last to board the 9-seater Cessna. Ushered to the small plane, I took the last seat, close to the exit door. The exit door had a latch that looked thinner than the latch on most trunk luggage. The combination of the exit door that looked as if it were about to fall off and the streak of rain on the window did not help alleviate my apprehension. We were flying low over the green valley surrounded by snow-capped mountains to Puerto Natales where we were to board a motor coach for another 2 ½- hour drive to Torres Del Paine National Park. The sky cleared up as we traveled on a two-lane road, snow-capped peaks (Sierra Dorothea Mountain Ranges) surrounding our view. Our guide started talking about the effect of glacial movement as we passed varying landscapes - deciduous forest, forest populated (the word used by our guide) by Antarctica ancient trees, and climbing terrain populated by Lenga trees, and ranches. He only stopped his narration when a seemingly disoriented cattle and calves brought our vehicle to stop. The gaucho appeared to have lost control over his herd. After the traffic jam, our guide continued to talk about the landscape created by the glacial movement: Fjord vertical river valley, and flat valley lower than sea level walled by rocky hills, and pampas - an enormous expanse of flat grassland dotted by sheep. Our driver voluntarily stopped the vehicle when he spotted a condor. As we neared the Chile-Argentina border crossing, we had a sampling of a harsh Patagonia wind. The highway tapered into a dirt road. We saw plenty of sheep, guanacos (a cross between a deer and a camel) and spotted different birds: condor, eagles, crested caracara. It was a very scenic drive to the park that my notebook was being filled with the names of things seen before arriving at the park. I caught my first glimpse of the distinct peaks (Torres) from Lake Sarmiento, an interesting lake that looked as if it had a ring around it. Our drive took us to the edge of the river 'Rio Paine' so we could see the cascading waters. It was also a great vantage point for taking pictures of the towers with the lesser horns. My camera replaced my note-taking. I started firing off my camera, trying to capture every possible angle of the famous jagged spires when all of a sudden, a lone guanaco emerged from a bush and moved towards us. As I turned my camera around to include the moving guanaco in my photo shoot, I fell into a thorny patch of bushes. There were varieties of bushes with unexplainable shades of green that seemed to have just sprung up amid the dark skeletons of dead trees. My tour mate picked up a charred piece of wood and showed it to our guide. It reminded our guide to talk about the two fires that destroyed several acres and forced closure of the park in 2009 and 2011. Both fires were caused by tourist's carelessness. However, I observed that the vegetation has returned and was ferociously green. We have not even reached the proper entrance of the park; I already observed the biodiversity of the place. Soon after the park entrance, our driver steered us around the edge of the lake and the massif. We spotted different types of animals – guanaco, swans, neandu, and Rheas by the lake. Photographing the massif was like a game of hide and seek. The jagged peaks hidden by the clouds would re-appear and disappear in a matter of seconds. 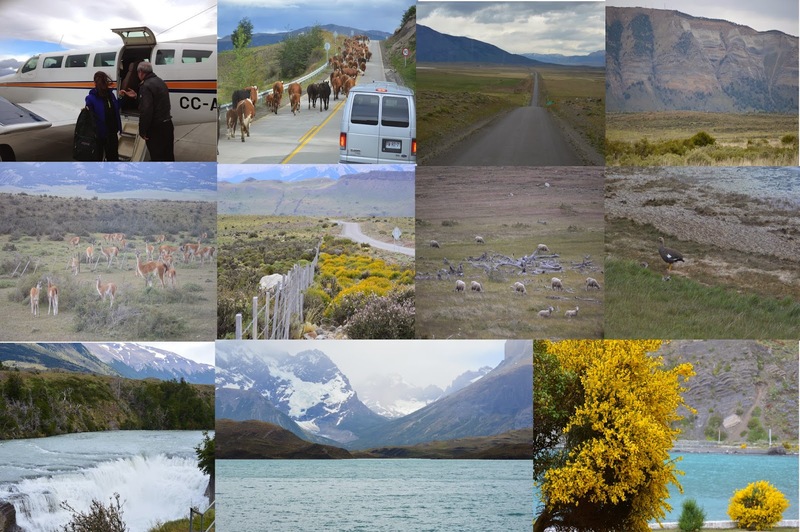 The disappearing massif gave me a better understanding of why UNESCO declared Torres Del Paine National Park as a Bio Reserve - because of not only its biodiversity but also for its microclimate. We passed the intensely blue Laguna Amarga (the name of the lagoon, Amarga, translates to bitter). The edge of the lagoon was white due to high-level contents of sodium and chloride. We were heading to the Hotel/Restaurant Pehoe by the lake. Approaching Nordenskjold Lake (named after Nils Otto Gustaf Nordenskjöld, a Finish/Swedish geologist and polar explorer), I heard a loud gust of wind stirring up the water on the lake, the crystal waters were of the most extraordinary blue I have ever seen. Oh, I noticed a bush full of green berries. According to our guide, they're called 'Calafate'. They looked like blueberries when ripe, and made into jams or jelly. And the flowers were delightful too! The flowers were orange velvet ladyslippers, porcelain orchids, and bright yellow lupines, they have a gorgeous scent. We crossed the bridge to get to the hotel/restaurant. The view from the restaurant, a few hundred feet away from the main dining terrace, was indescribable. I totally did not take the guidebook's advice to keep our expectations in check as the climate in the park can be abominable, with wind speeds of 100 mph and rain and snow even in the middle of summer. My guidebook says, "It’s common to spend a week here and not see the towers even once due to bad weather...But if you’re lucky to see the whole thing, then it will leave an impression that will last a long time”. I don’t usually read travel books before visiting a place because I don’t want my impression of a place clouded by what the other person experienced in that place. However, with Torres Del Paine National Park I went with a heightened expectation due a friend's account of his own experience. My friend told me that being there was like seeing the face of God. I visualized my friend’s words rising to the heavens as I gazed upon the ‘torres’ and the ‘cuernos’. For me, being there was an amazing feeling that I could not describe in words.